You know that a filmmaker has returned to fine form when you're compelled to a second viewing during a movie's first run. Maybe even soon going back for a third. After a few disappointments (including 2006's bewildering and nigh-incomprehensible Lady In The Water) my interest had grown wary - to put it mildly - in M. Night Shyamalan's work. The wunderkind who in 1999 brought us The Sixth Sense and then Unbreakable followed by Signs and The Village (a film I will never be ashamed to defend) had been hailed as "his generation's Steven Spielberg." But then Shyamalan kinda wandered off the reservation. Went weird. Became the strange relative who packs up and goes into places that only his deepest id seems to understand. Sometimes he comes back from the quest with renewed vision and perspective. Sometimes he doesn't. Sometimes he fails to come back at all. It wasn't until a few weeks ago on Christmas Eve that I finally saw Shyamalan's 2016 film Split. Even before then it intrigued me. The widespread word was that Split was shockingly good. And I have become a bit of a fan of James McAvoy. But then I heard that its final scene tied in with Unbreakable: a film that's enraptured me since first watching one late night at a theater in Asheville many moons ago. Even without knowing that the connection with Unbreakable was coming, I would have caught the common thread. Shyamalan had produced another comic book movie without being based on a comic book. McAvoy's character - dubbed "The Horde" by the end of the movie - is described so much as superhuman depending on which personality is dominant at the time, that Split was at least an obvious spiritual sequel to Unbreakable. The main deviation being that this was a super villain origin story (maybe the first one in cinema history). Shyamalan had regained my tenantative faith. He seemed on to something. And I knew that I had to ride this out to the end to see where he was taking this. So it is that on its opening weekend I caught Glass. An attempt was made to write a review shortly afterward but... I couldn't do it. Not without another viewing and absorbing the spectacle of not just this movie, but the entire tale leading up to it. That second viewing came last night and it only affirmed what had been on my mind in the days since first seeing Glass: that M. Night Shyamalan has delivered a true thinking-person's comic book saga. One well ahead of its time and I have to believe that admiration and appreciation for it is only going to keep growing. Some call it the "Unbreakable Trilogy". Shyamalan himself refers to it as the "Eastrail 177 Trilogy". My personal preference is simply "the Eastrail Trilogy". Whatever its name, Shyamalan has made Glass be the third act of the superhero trilogy that we don't deserve, that we didn't know we needed, and perhaps should be the morality tale we heed most right now. Glass begins three weeks after the events of Split, and David Wendell Crumb is still on the loose. Now nineteen years after the conclusion of Unbreakable, David Dunn persists in his persona as "Raincoat Guy", "Security Guard Man", whatever. The latest nickname that social media has given him is "The Overseer": a superhero monicker that Dunn's now grown-up son and business partner Joseph (again played by Spencer Treat Clark) relishes in the back-office lair of their home security store. Even now, Dunn is still looking out for people. And trying to distract himself from his status as a widower. When four cheerleaders disappear - the same M.O. as Crumb's previous abduction of Casey Clarke (Anya Taylor-Joy) and her friends - David and Joseph set out to track down The Beast. And it's not far into Glass that the two metahumans collide in combat. They are just as promptly apprehended and taken into custody and remanded to a high-security mental institution. The same high-security mental institution, incidentally, where a near-catatonic Elijah Price (Samuel L. Jackson) has been put away following his homicidal quest for superhumans nearly two decades earlier. David Dunn, The Beast, and Mister Glass all in the same psychiatric hospital. On the same ward. Within eyesight of each other. This won't end well. Or maybe it is going according to the plan of Dr. Ellie Staple (Sarah Paulson), who is determined to treat the trio for their "delusions of grandeur" simultaneously. Joseph attempts to convince Staple that his father's apprehension is a mistake. Casey - who has already grown stronger and more confident in the weeks since escaping The Horde - insists on seeing Kevin. And Price's mother (a very wonderful return to the part by Charlayne Woodard) tries reaching through the fog to her son, stalwart in her belief that a true mastermind endures behind that vacant stare. And anything more than this perhaps already too long synopsis would be depriving you, Dear Reader, of a rare comet illuminating the skies of what some are calling an increasingly dismal genre. Because Glass is a true intellectual's comic book movie. And it wraps up a true intellectual's comic book trilogy. This is a saga about superpowers not as a feast for the eyes but for the mind. The Eastrail Trilogy (yeah that's what I'm calling it from now on) is a morality exercise and it can't be broken down into a Cliff's Notes version. The only other comic book trilogy in the same neighborhood is Christopher Nolan's Dark Knight Saga: a character study as much as a straightforward adaptation. I will remark however, on Glass and how it succeeds as the end of the Eastrail Trilogy. Because in this comic book film universe there are indeed super-powered individuals. And they are everywhere. And more to the point they are each and every one of us. Shyamalan's is not a world where superhuman abilities belong to the very lucky or the mega rich or the divinely born. From the very beginning of this saga almost twenty years in the making, Unbreakable and Split and Glass have tried to drive home the message that, as C.S. Lewis beautifully put it, "you have never talked to a mere mortal." Perhaps it's not so ironic that David Dunn in his hooded poncho bears great resemblance to The Spectre as Alex Ross depicted him in the groundbreaking 1996 graphic novel Kingdom Come. "You have watched the titans walk the Earth," Spectre tells the elderly pastor Norman McKay, "and you have kept stride. Perhaps you are more like them than you realize. You exist... to give hope." Ross drew the depiction of the mysterious hero that appears in the newspaper toward the end of Unbreakable. Make of that what you will. Remember when The Matrix came out twenty years ago this spring? The more I think about it, Glass caps off a story that is even more potent. Is far more powerful. Is much more needed right now in our culture. But again, I might be saying too much. As with the best of books and movies, it's better to go in cold. And cold you will, because whatever you have ascertained from Glass's trailers, rest assured that it is not the movie you are expecting to go in seeing. 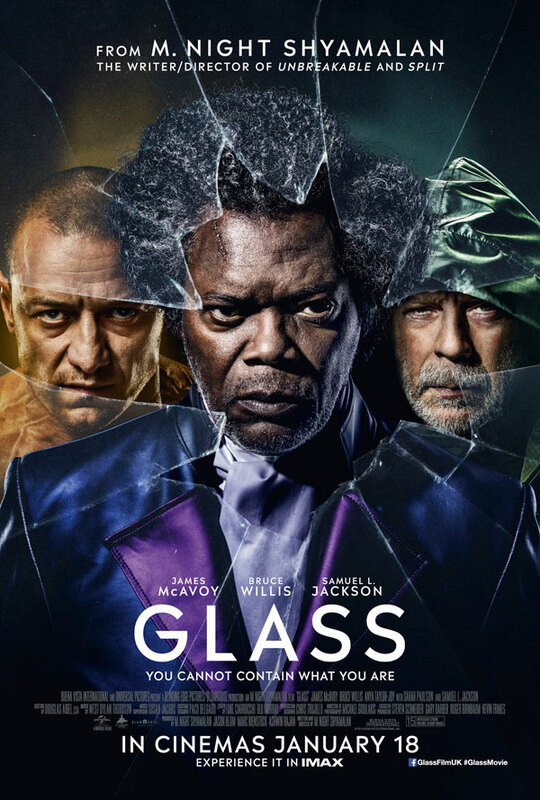 It takes a lot for me to make time lately to review a film, but Glass demanded it. I'm going to absolutely recommend catching this during its theatrical run. And if you can, by all means do take a refresher course with Unbreakable and Split before going to the theater. It's not required but it will help in appreciating the grander scheme at work across this trilogy. 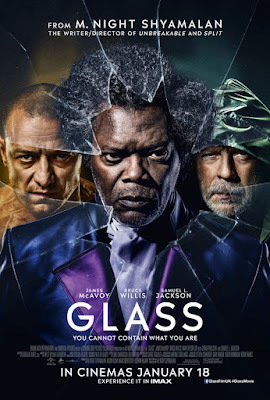 But even without that, Glass is a magnificent ensemble of cast, of concept, and of Shyamalan's grand mastery of the twist... and there are some. Oh bruddah, are there twists. Let's give M. Night Shyamalan a round of applause. The kid done good. And he's shown us something all too scarce lately: real growth and evolution of a filmmaker. If the previous decade and a half or so of lackluster product has been his time in the wilderness, then it has been time well spent and I am most certainly looking forward to seeing what he comes up with next.